Mr Shri Ravi Shankar Prasad, Union Minister for Law & Justice and Electronics & Information Technology – “India could be a $ 3 Trillion economic in the next 4 to 5 years that that is the goal we have set. Digital India is designed to empower ordinary Indian’s. Our idea is to make India the biggest manufacturing hub in the field of electronics with one crore employment in the electronics sector and 35-40 lakhs in the software sector”. Mr Rajan Mathew, Director General, COAI, “We are looking at $ 100 billion investment requirement which will primarily be driven by the private sector”. Amit Malviya Social Media & IT Chief, BJP – “BJP dominates the digital space; hence we are often accused of things that we haven't done like spreading fake news which can be interpreted wrongly”. New Delhi, March 13, 2019: TIMES NETWORK, India’s leading broadcast network, hosted the 5th edition of its landmark event, ‘Digital India Summit 2019’ today. Driving the 5th edition’s theme, ‘Unveiling India’s $ 1 Trillion Digital Dream’, the summit created conversations with the torch bearers of the digital universe to share their vision and insights to empower and transform India as the complete digital economy. Throwing the spotlight on fast-tracking Indian’s digital economy with more than 45 eminent speakers and 13 power packed sessions, Digital India Summit 2019 addressed the key sectors and industries in digital transformation including E-Campaigning, E-Health, E-Commerce, Financial Inclusion to Digital Payments, E-Food to Entertainment and Travel. Shri Ravi Shankar Prasad, Honorable Union Minister for Law & Justice and Electronics & Information Technology, delivered the keynote address highlighting the key contributing factors in achieving India’s $ 1 Trillion Digital Dream and Dinesh Kumar Garg, Executive Director - Union Bank of India, deliberated on Digital India with a focus on digital economy and financial inclusion. Speaking at the Digital India Summit, Shri Ravi Shankar Prasad, Union Minister of Law& Justice and Electronics & Information Technology said, “The IT industry is present in 200 cities of 80 countries with a turnover of 167 billion plus,125 billion exports, employing 40 lakh people directly and 1.25 crore indirectly, the industry employs 33% women and they are rising by the day”. “Digital India is designed to empower ordinary Indian’s, the entire digital ecosystem has advanced in the last few years and we wish to keep this momentum. Our Digital initiatives have empowered nearly 1.5 crore students with e-scholarship worth 5000 along with our initiative of Ayushman Bharat, 50 crore Indians are going to get assistance. In November 2016, there were only 4000 transactions per day on BHIM UPI app and in December 2018 it has reached 2 crores transaction per day, this is being propelled by people living in smaller cities”. “Shri Ravi Shankar Prasad further stated that there was a time when India consisted of only 2 mobile manufacturers and today there are 127 mobile manufacturers making India the second largest mobile manufacturing country only second after China. Our idea is to make India the biggest manufacturing hub in the field of electronics with one crore employment in the electronics sector and 35-40 lakhs in the software sector”. “India has become the 2nd largest start-up movement in the world with the valuation of Unicorn is higher than in the UK. Concluding, he added that any data imperialism will not be acceptable, we are creating India’s IT(Information Technology) + IT (India’s Talent) = ITIT, India could be a $ 3 Trillion economic in the next 4 to 5 years that that is the goal we have set”. Dinesh Kumar Garg, Executive Director - Union Bank of India, said, “Digital India is one of the biggest government programs in the world to bring about sustainable and inclusive societal transformation using digital technologies. The process of making India into a trillion-dollar digital economy has begun and Digital India is making this dream a reality. Technology is already playing a crucial role in driving financial inclusion of the under-banked as well as the un-banked population in the country. Digital India is the biggest step towards Digital Economy & Financial Inclusion. We at Union Bank Of India are committed to helping India achieve its digital vision. We are proud to partner Times Network in this impact initiative”. Amit Malviya, IT Chief, BJP shared views on the digital impact on consumers, "The disruption in social media has caused a lot of change and has given easy access to consumers to share their views and today it is so powerful that it has become a mainstream platform. BJP dominates the digital space; hence we are often accused of things that we haven't done like spreading fake news which can be interpreted wrongly. Today, there are several platforms and millions of people using apps like TikTok, Sharechat, Facebook. Such apps keep tier2, tier3 cities well informed and cannot be deceived by fake news". Speaking on ‘Is India 5G ready’? 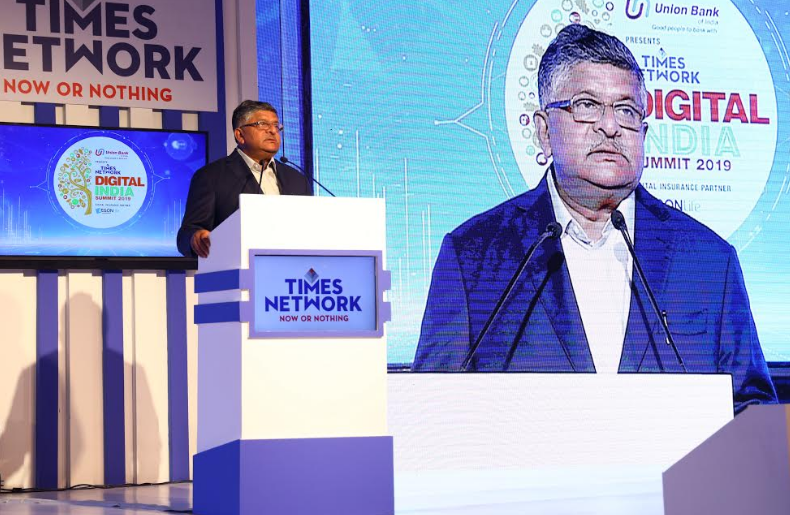 Rajan Mathew, Director General, COAI said, “ India is still behind in the race for 5G, there is tremendous long-term investment required to get our 4G networks in shape, keeping in mind capacity and quality issues. We are looking at $ 100 billion investment requirement which will primarily be driven by the private sector and unless issues of financial stress are dealt with, we are far from reaching the 5G era. We seek the government’s attention to this, allowing telecom players to make essential investments to take the country towards a robust 4G and then question ourselves, are we 5G ready? Attended by some of the most valued dignitaries in India across sectors, the summit witnessed a diverse network of thought leaders, digital gurus, policymakers addressing the audience through a series of panel discussions and deliberations on enabling the country’s greater digital progress. The notable speakers at the summit included Amit Malviya, Social Media & IT Strategist – BJP, Aashish Yadav, Social media & IT Strategist - SP & BSP , Ankit Lal, Social Media & IT Strategist - AAP, Nath Parameswaran, India Director – Paypal, Rajan Mathews, Director General -, Cellular Operators Association of India, , Deep Kalra, Founder & Group CEO - Make My Trip and Upasana Taku, Founder & CEO – Mobikwik, Tarun Katial, CEO -ZEE5 and Amanpreet Bajaj, Country Manager - Airbnb among others. The 5th Digital India Summit 2019 is presented by Union Bank of India, digital insurance partner - Aegon Life Insurance, OTT partner - MX Player, associate partner – Toshiba, CSR partner -Honda, digital cinema partner – UFO Movies and solution partner – SAP.